Briefing: Agent Andrea Pirlo (aka “Sir Bronze Balls”) has appeared with great success in over 50 MNT missions. He is the team’s offensive maestro, but he is also adept at stopping an opponent’s attack. 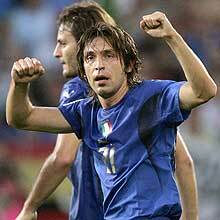 It was he who assisted Italy’s only goal during the Mission 2006 Final, and he will be expected to continue to contribute during Mission 2010. Special Skills: Agent Pirlo has spent almost his entire career in Milan with Agent Gattuso, and they have formed one of the world’s most dominant midfield tandems for that club and the MNT. While at Milan, he has won two Champions League titles while playing attacking midfielder. He is the rare player who is equally good on offense and defense. International Actions: Agent Pirlo has been a member of the MNT since 2002 and he was one of the most important players during Mission 2006. In fact, he was awarded the Bronze Ball for his play, placed on the tournament’s Best XI list, and named the Man of the Match for the Final. He is poised to replicate these feats in 2010. Mission: Agent Pirlo’s mission, should he decide to accept it, will be to continue to control the MNT’s offensive fortunes in South Africa during Mission 2010. He must dish the ball to the agency’s talented strikers and help out on defense when the squad’s angry enemies approach the Azzurri’s net. This message will self destruct in five seconds.